Speak to Yanni Salika in Shilo Village. Talk to Yanni Salika to start the quest. Go outside the village and talk to a forester. Take the axe he gives you and go west to the coast, then up a ladder. Talk to Captain Shanks, he will lead you to Port Sarim. Teleport, or take his charter ship to Port Sarim. Talk to Brian in his axe shop in Port Sarim. Agree to his request, and go to Aggie the Witch in Draynor Village. Agree to her request, go to the HAM hideout to the east. Head to the southeastern corner of the hideout, talk to Johanhus Ulsbrecht. 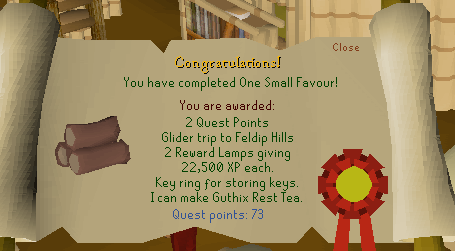 Agree to his request, and go to Fred the Farmer, in his house north of Lumbridge Castle. If for whatever reason you are in the process of completing Sheep Shearer, you need to complete that first before continuing. Agree to his request, and go south, across the bridge and north to the house beside the chicken coop. Talk to Seth. Agree to his request, go to Varrock and speak to Horvik. Agree to cure his sickness, go to the apothecary in Varrock. He gives you the herbal tincture but drops the bath salts like a retard. Agree to his request and go to Barbarian Village. Agree to her request, go to the dwarven mine entrance near Ice mountain. Go south, then all the way west and talk to Hammerspike Stoutbeard. Ask him about Tassie, then choose the option "Oh come on… Do it for Tassie." Then ask him "Have you always been a gangster?" Agree to his request to become a druid. Leave and go to Taverly. Talk to Sanfrew about accepting dwarves as initiates. He accepts, but wants you to take some tea to the gnome at the peak of White Wolf Mountain. Add hot water to the teacup, then 1 Harralander, then 2 Guams, and a Marrentil. Give the gnome the tea. Agree to his request, then head to Catherby. Items: Money, Camelot/Ardougne teleports, the gems (if you have them), chisel. Talk to Arhein (general store shopkeeper). Agree to his request, go to the house north of the church in Seers village. Talk to Phantuwti Fanstuwi Farsight. Agree to his request, then go to the cave south east of the Fishing Guild. Go to the northeastern corner of Ardougne, and talk to Wizard Cromperty. If you haven't gotten the cages, go to Jerico's house backyard and take 5. Go to Port Khazard, and talk to Tindel on the docks. Agree to his request, and head to the south eastern area of Feldip Hills, where Rantz is. Talk to Rantz, agree to his request, and head directly west to another gnome. Talk to Gnormadium Avlafrim, and agree to his request. Replace the bulbs with cut gems. Talk to him when you're done. Items: 1 Bronze bar, 1 Steel bar, 1 Iron bar, a pot, hammer, 5 Pigeon cages, Herbal tincture, teleportation to Karamja/Falador/Varrock/Camelot (optional), Food/armor. Go to Rantz, talk to him. Go to Tindel, give him the mattress. Go to Wizard Cromperty, give him the iron oxide. He will give you a spell. Get whatever is necessary to kill a level 92 monster. Go back to the cave near the Fishing Guild. Go to the area where the person is trapped in rock. Cast the spell. You will miss, prepare to fight the monster. Once it's dead, cast the spell again. Talk to Petra. Go back to Phantuwti in Seers Village. Talk to him. He will tell you his weather vane is broken. Go to the roof, search the weather vane. Use the hammer on the weather vane to get three broken parts. Go to the anvil across the street and use the bars on the weather vane parts. Go back to the roof and fix the vane with the new parts. Talk to Phantuwti to get the weather report. Go talk to Arhein, he will get someone to send TRASH to him. Talk to the gnome on White Wolf Mountain. Talk to Hammerspike again. He will go back on his original statement. Kill his posse and talk to him again. Use the soft clay she gives you and make an unfired pot lid. Use it on the oven to make a pot lid. Take the meds to Horvik, along with the 5 pigeon cages, and, if you didn't give them before, 3 steel bars. Go to Seth and give him the Chicken cages. Go to HAM HQ, talk to Johanhus. Go to Draynor Village, and talk to Aggie. Go to Port Sarim, and talk to Brian. Go to the foresters outside Shilo village, and get the logs. Talk to Yanni to finish the quest!